I get told by a number of my social media followers that while they’d love to go all-out with their makeup on a daily basis, they need something more toned down for work. Whether it has to do with workplace policies or just wanting a streamlined routine in the morning, their makeup for work is usually more “boring” than the bright cut creases and sultry smoky eyes you find on Instagram. I’ll admit— it’s been a while since I’ve worked in an office environment. I have the freedom to color my hair crazy colors, wear full glam, or literally sit in my PJs with my hair undone all day. 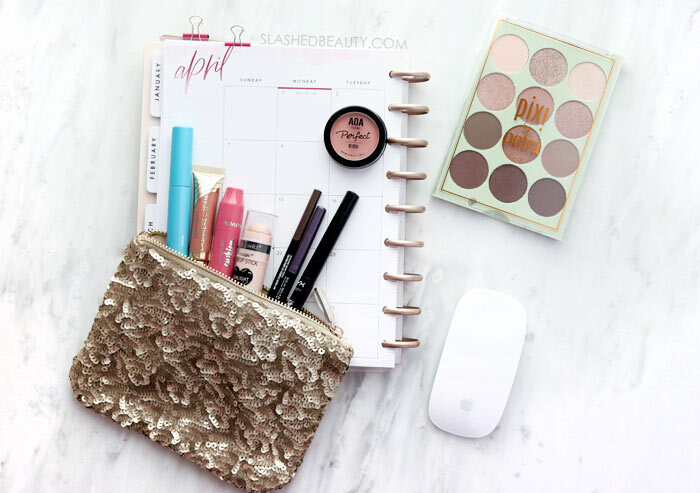 But, I definitely understand the need for an easy and versatile every day makeup look for work, so I’ve rounded up some of my favorite products to create a daily makeup routine for work. This is one of my favorite daily foundations. It really does make your skin appear healthy and radiant with a natural skin finish. The formula is medium coverage so you can definitely even out skin tone and cover mild problem areas. It feels really good on the skin— never crackly or cakey— and lasts all day. It also has SPF 20 to protect your skin. My brow go-to for the past year, this pencil is easy to use and creates natural looking brows. I love the attached spoolie to help brush the product through and soften the appearance, but you can also get precise definition with the fine point of the twist-up pencil. I always talk about Pixi skin care, but this is one of the best makeup gems from the brand. It contains 12 neutral shadow shades with a great balance between mattes and shimmers so you can still have a subtle sparkle in your look. 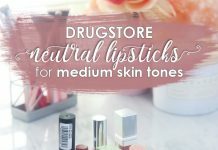 These shades are very easy to work with and mix and match for versatile work appropriate makeup looks. Work makeup doesn’t need to be dull. Eyeliner is a great way to add a pop of color and personality without it being too overpowering. I love wearing a purple liner, which makes my brown eyes pop. You usually can’t tell it’s purple unless you’re looking pretty closely, anyway! This pencil eyeliner from covergirl is super creamy and easy to smudge out or apply precisely, and once it sets it will stay all day. It comes in a variety of colors— yes, black, too. If you’re more of a liquid eyeliner fan, there’s nothing better than the NYX Matte Liquid Liner. It’s my everyday product for cat eyes, and I’ve been using it pretty exclusively for the past several years. 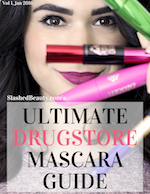 I like lighter mascaras for every day use, and the Hydro Boost mascara from Neutrogena is perfect. It hydrates and plumps the look of your lashes with a formula that contains hyaluronic acid, vitamin E and keratin so you’ll never have that stiff feeling. It doesn’t smudge or flake, and looks natural while adding length and volume. An awesome $1 find from Shop Miss A, the AOA Perfect Powder Blush is smooth and pigmented and can be applied lightly for a wash of color or built up to be more of a statement. I love how natural it looks on the skin— this shade is Delight. 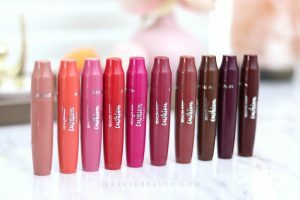 I love makeup sticks that help application go quicker! 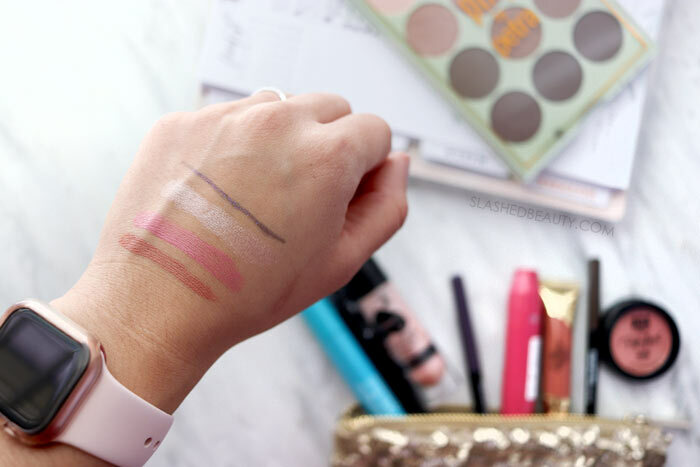 This highlighting stick from Wet n Wild is a swipe-and-go product. Blend it in with your fingers and you’ll have a beautiful glow in less than a minute flat. Everyone likes something different in a lipstick, but these two can pretty much cover all the bases. The Revlon Cushion Lip Tint is a comfortable formula that’s balmy and will leave behind a stain that lasts for hours. The BH Cosmetics Cashmere Cream is a liquid lipstick that is semi-matte and gives you full coverage color without dryness at all. 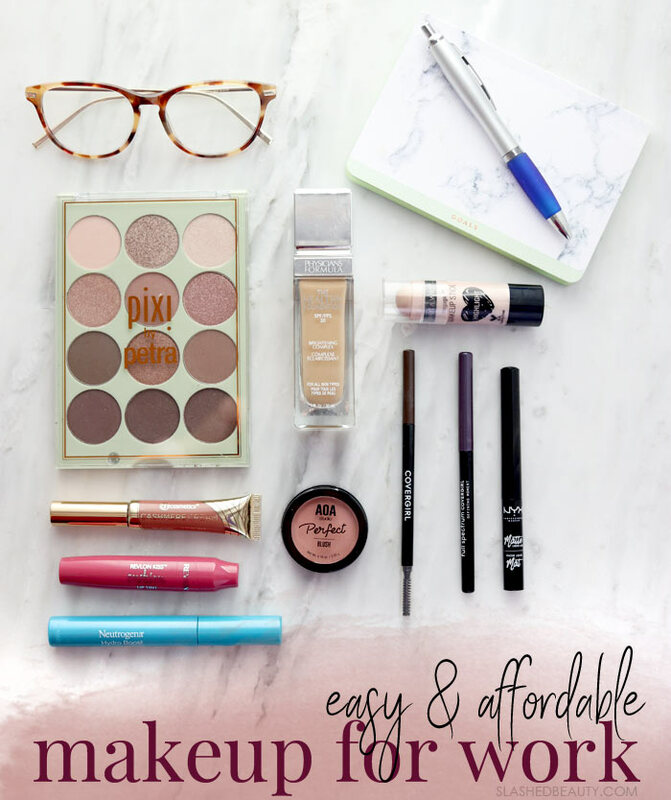 Here are what the products look like put together, creating a perfect everyday makeup look for work! I opted for the BH Cosmetics lipstick and the purple Covergirl liner— you can see how subtle the color is but it still adds something special to the eyes. 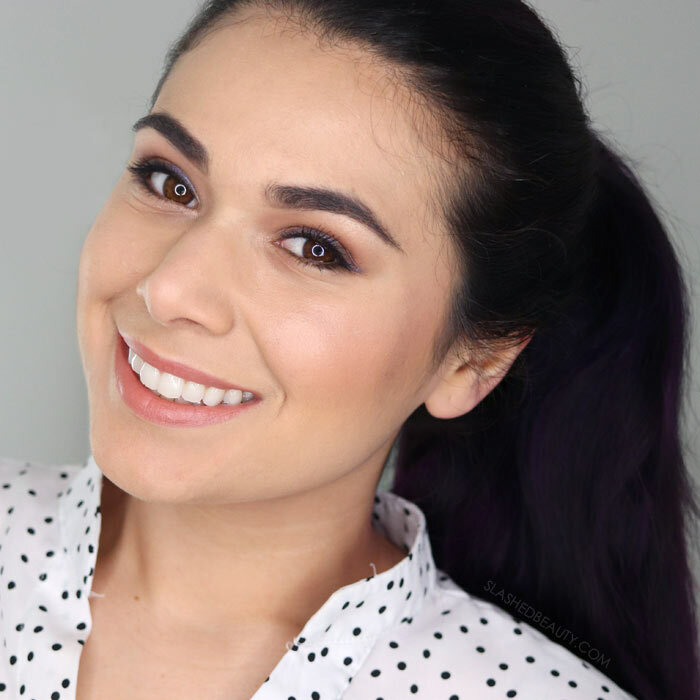 Whether you work in an office, or in a customer service position helping customers, this is a really easy and budget-friendly makeup routine for work that serves as a jumping off point to add your own spin. Switch up your lip color or eyeliner shade to mix things up with seasonal trends if appropriate. What makeup do you typically wear to work?